Caption from the Smithsonian Global Volcanism Project: Conical Volcan Arenal is the youngest stratovolcano in Costa Rica and one of its most active. The 1670-m-high andesitic volcano towers above the eastern shores of Lake Arenal, which has been enlarged by a hydroelectric project. Arenal lies along a volcanic chain that has migrated to the NW from the late-Pleistocene Los Perdidos lava domes through the Pleistocene-to-Holocene Chato volcano, which contains a 500-m-wide, lake-filled summit crater. The earliest known eruptions of Arenal took place about 7000 years ago, and it was active concurrently with Cerro Chato until the activity of Chato ended about 3500 years ago. Growth of Arenal has been characterized by periodic major explosive eruptions at several-hundred-year intervals and periods of lava effusion that armor the cone. 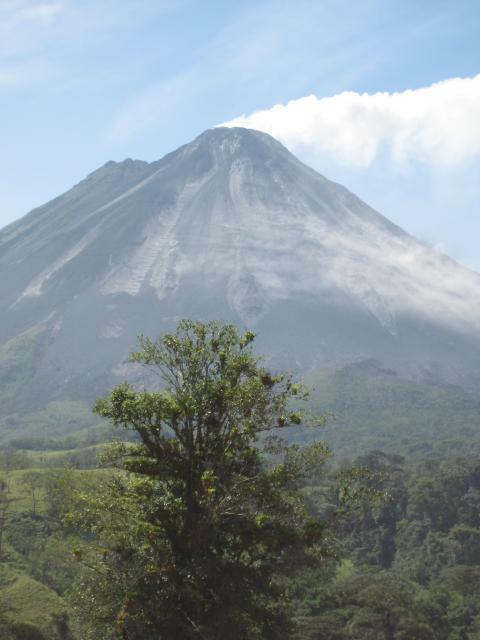 Arenal's most recent eruptive period began with a major explosive eruption in 1968. Continuous explosive activity accompanied by slow lava effusion and the occasional emission of pyroclastic flows has occurred since then from vents at the summit and on the upper western flank. Highest point 1670 m (5,479 feet). For an example of studies on these Central America volcanoes, see Fischer et al., 2002.